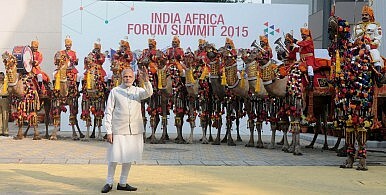 Narendra Modi prepares to receive guests to the India-Africa Forum Summit in 2015. India’s prime minister seeks to secure partnerships in Mozambique, South Africa, Tanzania, and Kenya. Prime Minister Narendra Modi is set to embark on his maiden tour to Africa, during which he will travel to Mozambique (July 7), South Africa (July 8-9), Tanzania (July 10) and Kenya (July 11). Although this visit comes more than two years after Modi assumed office, it would be fallacious to presume that Africa has been off his radar. In fact, quite the contrary! Modi organized the Third India-Africa Forum Summit (IAFS-III) in October 2015, when for the first time he invited all 54 heads of state/government (HOS/G) of African countries as well as the president of the African Union to India. At IAFS-II, 41 countries were represented by leaders at the HOS/G level while others were represented by vice presidents and senior ministers. Several far reaching decisions were adopted, including an additional concessional credit of $10 billion over five years; grant assistance of $600 million, including an India-Africa Development Fund of $100 million and an India-Africa Health Fund of $10 million; 50,000 scholarships in India over next five years; and the continuation of Indian support for, and expansion of, the Pan African e-Network project. This major initiative was followed by two recent high-ranking visits by Indian leaders. President Pranab Mukherjee traveled to to Ghana, Ivory Coast, and Namibia in West Africa from June 12 to 17 and Vice President Mohammad Hamid Ansari visited Morocco and Tunisia in North Africa from May 30 to June 3. Modi’s visit to South and East Africa represents an attempt to reach out to all parts of Africa. All four countries that Modi will visit have long coastlines and are linked with India by the Indian Ocean. India has been active in guarding trade routes, securing coastlines, and countering piracy around the Gulf of Aden, Gulf of Guinea, and Indian Ocean. Maritime security, along with the blue economy, are likely to be priority areas for discussions during the visit. Talks will be driven primarily by the convergence of bilateral interests but also due to growing ambitions of China in the Indian Ocean and its recent move to establish a military base in Djibouti. Terrorism and radicalization will also be seriously discussed as India and Mozambique, South Africa, Tanzania, and Kenya are severely afflicted by these twin scourges. The influence and reach of Islamic State is expanding and it is essential to evolve and implement multi-pronged, joint strategies to approach the problem. India’s political relations with all four countries are already vibrant and deep-rooted. With South Africa in particular, contacts have been frequent and regular. In addition to meeting at IAFS-III in India, President Jacob Zuma and Modi met at the BRICS summits at Fortaleza, Brazil in July 2014 and at Ufa, Russia in July 2015, as well as at the G20 summit in Brisbane in November 2014. Both South Africa and India are members of a number of multilateral groups, including BRICS and G20 as well as IBSA (India, Brazil, South Africa) and BASIC (Brazil, South Africa, India, China). Meanwhile, it was reported that at the recent plenary of the Nuclear Suppliers Group (NSG) in Seoul, South Africa raised some procedural queries regarding India’s membership in the body. Modi’s visit will provide a useful opportunity to address South Africa’s concerns and solicit its unequivocal support for the next NSG meeting. In Tanzania, new President John Magufuli, who took charge last November, has launched several initiatives in areas close to Modi’s own heart, like cleanliness, combating corruption, climate change, and protecting human security. Modi will find a kindred soul in Magufuli. Meanwhile, Modi’s visits to Kenya and Mozambique will be the first prime ministerial visits to these countries since 1981 and 1982 respectively. Modi’s meetings with leaders of the four countries will present a crucial opportunity to energize bilateral ties, identify fresh areas for collaboration, and take relations to new heights. There is keen interest in these countries to further expand, diversify, and strengthen bilateral and regional linkages with India. Trade and economic relations as well as energy ties form the bedrock of multi-faceted links between India and these four nations. Bilateral trade in 2014-15 with Tanzania was $4 billion, with Kenya $4.3 billion, with South Africa around $12 billion (having come down from $15 billion in 2011 on account of India’s restrictions on gold imports), and with Mozambique around $2.4 billion. Except for the case of South Africa, trade is heavily weighted in India’s favor. The major Indian exports to the four countries include drugs and pharmaceuticals, motor vehicles, petroleum products, textiles, and engineering goods while imports consist of gold, cashew, timber, spices, minerals, and coal. Out of around $32 billion in total Indian investment on the African continent, Mozambique alone accounts for $8 billion and Tanzania $3 billion, with most investments in the energy sector. Indian companies have invested heavily in coal and gas sectors in Mozambique and in natural gas in Tanzania. Several large and iconic Indian companies like Tata Group, OVL, OIL, JSPL, JSW, Reliance, Mahindra, Ranbaxy, Cipla and many more are active in these countries. A serious proposal to produce pulses in Mozambique for export to India is likely to be taken up during the visit. Energy security, agriculture and food processing, education, health, skill development, and infrastructure will be other key areas of discussion. By boosting Africa’s food production, India can help meet its own food requirements through imports. The Indian diaspora is present in considerable numbers in these countries, the highest population being about 1.5 million in South Africa, representing 3 percent of total population. There are 50,000 people of Indian origin in addition to 10,000 Indian nationals in Tanzania, and 80,000 persons including 20,000 Indian passport holders in Kenya. As has become the norm for Modi’s visits to foreign destinations, he will reach out to the diaspora communities. Modi will address a mammoth 20,000 strong rally in Nairobi on July 10 and a smaller 10,0000-strong crowd of Indian origin residents in Johannesburg on July 8. Modi will also undertake the symbolically significant and historically important train journey from Durban to Pietermaritzburg, the railway station at which Mahatma Gandhi was forcibly evicted from the train because he refused to leave his first class compartment in June1893. Modi’s visit will also be designed to help quell concerns about alleged racist attacks against African students and nationals in India, which have been in the news in recent months. Africa is a region that India cannot afford to ignore. Six of the world’s ten fastest growing economies are located in Africa. Huge complementarities exist to strengthen bilateral collaboration in diverse areas and upgrade India-Africa engagement. India is Africa’s fourth largest trading partner, with trade turnover of $72 billion in 2014-15. India has invested around $32 billion in the continent. The basket of goods imported from Africa is dominated by commodities, particularly crude oil, gas, pulses and lentils, leather, gold, and other metals, all of which are of critical importance to the Indian economy and people. India exports manufactured products like medicines, automobiles, two-wheelers, iron and steel products, plastics, machinery and engineering products, as well as refined petroleum products. Africa represents a new and growing export market. This is significant as India’s traditional export destinations in Europe and North America are declining. Africa’s partnership and active engagement is crucial for progress in global and regional issues. Support from African countries is critical while negotiating subjects like India’s bid for permanent UN Security Council seat, UN reforms, and climate change. Modi’s first visit to Africa is timely and portentous. It will strengthen political, strategic, security, economic, and people-to-people ties with these countries and also with the whole continent. This will give an impetus to security, stability, peace and prosperity in the region and the world. Ashok Sajjanhar is a career diplomat who has served as Ambassador of India to Kazakhstan, Sweden and Latvia, and also as Secretary/Principal Executive Officer of the National Foundation for Communal Harmony, an autonomous organization with the Ministry of Home Affairs. He has held several significant positions in Indian embassies in Washington, Moscow, Brussels, Geneva, Bangkok, Tehran and Dhaka.